Nick Bane Animation Reel April 2016 from Nick Bane on Vimeo. Here are some samples of my boards for Tourbus season 2! Due to the nature of such a fast paced documentary series, you'll notice a these boards are a lot more rough than you may expect, but instead of being misleading by cleaning them up after the fact I wanted to post what the actual boards looked like! Enjoy! 207MD_SB_JimmyAndTerryFired_NB_V06 from Nick Bane on Vimeo. I'll try to update this as episodes air! Thanks! If you'd like to see some more board or animation samples, let me know and we can work something out! Some Storyboards I did for season one of Tales from the Tourbus. This was from the Blaze Foley episode, three separate sections where Blaze is trying to sell an old guitar. Something that is unique to Tales from the Tourbus is that we work fast so the boards stay rough, instead of cleaning these up and posting them as if thats how we work, I wanted to show you actual work done for the show. I'll take the password protection off of this when it airs, until then you'll have to email me for the password! Looking forward to this one! I boarded, designed, and animated on this episode! I'm an animator, I like to make cartoons! 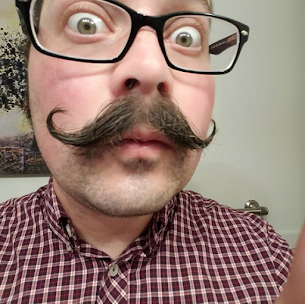 Sometimes I have a moustache, sometimes I don't!